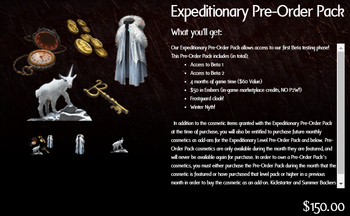 The Expeditionary pre-order pack was available from the Cosmetic store. 4 months of game time ($60 value). $50 in Embers (in-game marketplace credits). Pre-order pack cosmetics are only available during the month they are featured and will never be available again for purchase. In order to own a pre-order pack's cosmetics, you must either purchase the pre-order pack during the month that the cosmetic is featured or have purchased that level pack or higher in a previous month in order to buy the cosmetic as an add-on. 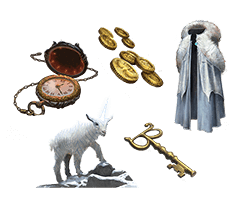 In addition to the cosmetic items granted with Pre-order packs, purchasers will also be entitled to purchase future monthly cosmetics as add-ons for their pre-order pack level and below. Kickstarter and Summer crowdfunding backers will always be able to purchase pre-order pack cosmetics as add-ons. This only applies to the current month's cosmetics and beyond. Cosmetics owned prior to upgrading a pre-order pack are retained. Cosmetics in the new package tiers in the month of the upgrade are gained. ↑ Ashes of Creation cosmetic store. This page's content was last modified on 12 February 2019, at 21:50.